You may have taken the brave step of choosing Singapore as your next home but over time, you realise that one thing remains the same — the tasteless blasting of music and the heavy grunting of males at the nearest local gym, a seemingly global trait for any gyms in the world. Maybe it’s high time you ditch the air-conditioned setting of conventional fitness gyms and get yourself involved in some rough and tumble with these super fun, supercharged outdoor boot camps that are available on this island. The best part is, you can even bring your pertness or toddlers with you and share the fun! Having been in the fitness scene for over a decade, female founders Toni Finan and Sanem Bourdier sure know how to rough it out under the sun with their Better Bodies Boot Camp. They offer a range of fun themed boot camps ranging from the standard Bootcamp for newcomers and beginners to Pilates and the more advanced TRX Circuit and Bootycamp, all of which offers you a fun-filled full body workout. If you are all about the sass and the bass, we suggest you opt for the Bootycamp to work that fine junk in your trunk. Bootycamp involves little to no cardio, so you do not have to worry about reapplying your makeup foundation after the session. Instead, it optimises the use of resistance bands and a ton of bodyweight exercises to tone up your physique and perk up that booty as you have always longed for. Better Bodies Boot Camp also leaves you with little excuses spare as they offer a ridiculous ten classes a week for your convenience. Working shifts? No problem! Simply pick a morning slot on your off days. End work late? All the better! You can make your down straight from your office for their evening classes. Their boot camps are conducted in a six-week cycle all year round, with about a week of rest interval in between each of the cycles. Six weekly sessions will set you back by about $150 and participants usually get it down and dirty at four locations, including Newton, Botanic Gardens and Toa Payoh. Mothers take heart! We know how much your body has gone through after all the pregnancies and the burning desire to get back in shape amidst all the adulting duties. Well, for mothers who are looking to shape and sculpt their bodies into their pre-natal state without shipping their hyperactive children to Madagascar or to their designated childcare centres, Bloom’n Fit has got your back (and your bubs) covered. Bloom’n Fit’s Strollastic boot camp is probably of the few outdoor classes that welcome and encourage mothers to bring along their cute babies and cheeky toddlers for their morning boot camp sessions that see the use of resistance bands, kettlebells and medicine balls to get your heart pumping and gains going. And no, your precious little ones will not be passing the medicine balls among themselves or swinging the kettlebells to and fro like they do with their bedtime bolsters. The exercises are strictly for the adults, but the entire area is for the bubs — no one will stop them from running to their heart’s fullest content to drain some of the excess energy. 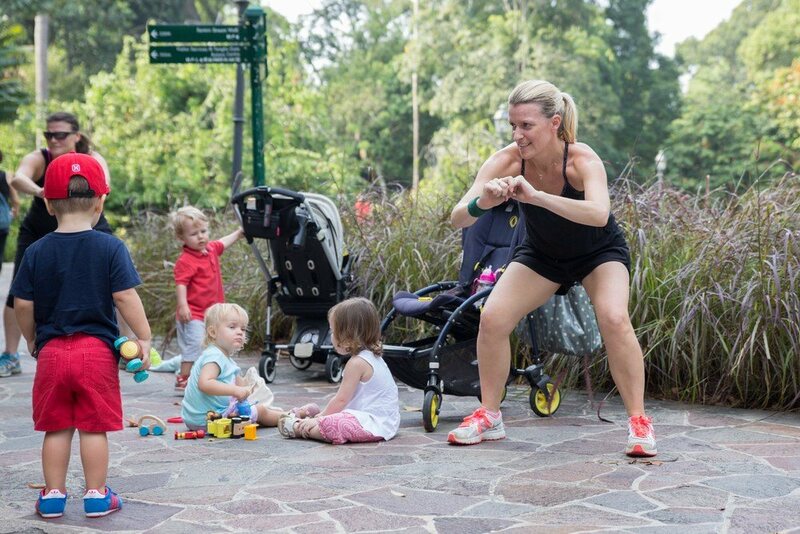 Strollastic is conducted thrice a week in an hour-long session that is managed by April Rice, a qualified instructor for pre- and post-natal fitness. Classes are usually held at different locations within the Botanic Gardens every once in a while to give the children a refreshing change of scenery. For an affordable fee of $25, you can pop by with your little ones in any of these tri-weekly classes. What do you get when you put seven coaches of fitness, sports, powerlifting and endurance racing background in one room? A kickass, pie-in-the-mouth, helluva boot camp called FuelFit that places much emphasis on the close monitoring and tracking the progress of each individual. With that focus in mind, individuals are required to go through their customised fitness consultation and assessment before jumping straight into the depths of the first boot camp session. This pre-boot camp consultation is essential for the trainers to establish your vital stats and aptly gauge fitness level. Once that is over and done with, the highly qualified coaches will continue monitoring the progress of your monthly body composition measurements and quarterly fitness appraisals, along with some sage nutrition advice. The different boot camps offered by FuelFit include formats such as bodyweight and equipment-based workouts, time-based training, partner work and fitness games. A full class typically houses a range of six to twelve participants that sees a healthy mix of couples and parent-child duos. Akin to a flexible fitness membership plan, participants have the freedom of choosing which location they would like to attend the classes at.But they are required to bring along their own personal foam mat.